of Arlington, June 6th at fifty-four years of age. Cherished daughter of the late Dr. Lawrence C. Salvesen and Janice M. (Roche) Salvesen of Winthrop. Dear sister of Kjerstin Salvesen and her husband Thomas Quinn of Lincoln, Bryant Salvesen and his late wife Adeline of Tyngsboro and the late Michael C. and Andra Salvesen. Adored aunt of Liam Quinn, Mikaela and Birgitta Salvesen-Quinn and Alexandra Salvesen. Gretchen is also survived by many cousins and friends. A Funeral Mass will be celebrated in St. John the Evangelist Church, 320 Winthrop Street, Winthrop, MA 02152, Saturday, June 23rd at 11:30 a.m. Burial is private. Relatives and friends are invited to call from 10:00 – 11:15 a.m. in the Church prior to the service. Remembrances may be made in Gretchen’s honor Northeast Animal Shelter 347 Highland Ave., Salem, MA 01970 or to the Care Dimensions Hospice House 125 Winter St, Lincoln, MA 01773. For directions or to leave an online condolence, please visit www.lynch-cantillon.com or Facebook under Lynch-Cantillon Funeral Home. 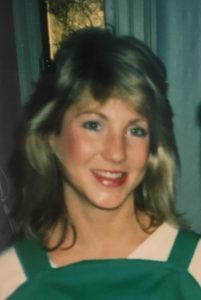 Gretchen Salvesen passed away on June 6th, 2018 at the age of 54. She was born in Boston in September of 1963 and grew up in Manchester-by-the-sea. Gretchen, the youngest of five children, was the beloved daughter of Janice (Roche) Salvesen of Winthrop, and the late Dr. Lawrence C. Salvesen. She graduated from the University of Massachusetts with concentrations in Political Science and Spanish. She studied abroad in Spain and Argentina and through these experiences she became proficient in Spanish and gained an appreciation for other cultures. After college, Gretchen worked at the Massachusetts Migrant Program. This program provides educational and health services to children from migrant families. She thrived in jobs where she felt she could make a difference. Gretchen lived in Arlington for the last two decades. She was known in her community for her friendly and generous nature. One of her strongest qualities was her ability to connect with people from different backgrounds. She had a wonderful sense of humor and enjoyed telling stories about her nieces and nephew. Gretchen cared deeply about her family and friends and she will be remembered for her loving spirit. Gretchen was predeceased by her father, Dr. Lawrence Salvesen, her siblings, Michael C. and Andra Salvesen, her dear sister in law, Adeline Salvesen, and her maternal aunt and uncles, Monsignor William Roche, Virginia Murphy and Richard Roche. Gretchen is the beloved daughter of Janice M. (Roche) Salvesen of Winthrop, cherished sister of Kjerstin Salvesen, her husband Dr. Thomas Quinn of Lincoln, and Bryant Salvesen of Tyngsboro. Adored aunt of Alexandra Salvesen, Liam Quinn, Mikaela, and Birgitta Salvesen-Quinn. Gretchen is also survived by cousins, friends, and her dog Nico. A Funeral Mass will be celebrated in St. John the Evangelist Church, 320 Winthrop Street, Winthrop, MA 02152, Saturday, June 23rd at 11:30 a.m. Burial is private. Relatives and friends are invited to call from 10:00 – 11:15 a.m. in the Church prior to the service. Remembrances may be made in Gretchen’s honor to; Northeast Animal Shelter, 347 Highland Ave., Salem, MA 01970 or to the Care Dimensions Hospice House, 125 Winter St, Lincoln, MA 01773. For directions or to leave an online condolence, please visit www.lynch-cantillon.com or Facebook under Lynch-Cantillon Funeral Home. A Funeral Mass will be celebrated in St. John the Evangelist Church, 320 Winthrop Street, Winthrop, MA 02152, Saturday, June 23rd at 11:30 a.m. Burial is private. Relatives and friends are invited to call from 10:00 – 11:15 a.m. in the Church prior to the service. I am so very sorry for your loss Gretchen was a dear friend to my sister Marie – one of the most kind spirits that I have known. Peace, comfort and healing light to all who are missing her. I am so very sorry to hear of Gretchen’s passing. She was such a gentle and kind girl growing up here in Manchester. The family has endured so much loss I am so sorry for their pain.My thoughts and prayers are with you all. Peace and prayers at this time of sorrow to her family from a highschool classmate at mtbs. Gretchen was always a kind friend and I am so sad to hear of her passing. What a wonderful young lady. Now in the arms of her loving God. No more tears nor more pain. Praying for her family knowing that Gretchen is now praying for us. God grant us PEACE and SERENITY. To all the Salvesen family, our hearts are broken for all of you. We again share your grief and your loss and will help carry your burden as best we can. The thought that she has joined the rest of your family and my mom, dad and Coles gives me a small bit of comfort.